In this SFI Community Lecture, economists Wendy Carlin and Samuel Bowles outline a new economic paradigm as the basis for a more sustainable and just global future. Samuel Bowles is Professor at the Santa Fe Institute, where he heads the Behavioral Sciences Program. His studies on cultural and genetic evolution have challenged the conventional economic assumption that people are motivated entirely by self-interest. Recent papers have also explored how organizations, communities, and nations could be better governed in light of the fact that altruistic and ethical motives are common in most populations. Bowles is now engaged in theoretical and empirical studies of political hierarchy and wealth inequality and their evolution over the very long run. He has written several books and authored numerous publications in scholarly journals. His most recent book is The Moral Economy: Why Good Incentives Are No Substitute for Good Citizens (Yale University Press, 2016). Bowles works with Carlin on the Curriculum Open-access Resources for Economics (CORE) project, and has also served as an economic advisor to U.S presidential candidate Robert F. Kennedy, the Pontifical Academy of Science (Rome), and South African President Nelson Mandela. Wendy Carlin is Professor of Economics at University College London (UCL) and Research Fellow of the Centre for Economic Policy Research (CEPR). She is leading an international project — the CORE project — to reform the undergraduate economics curriculum. She has published widely on macroeconomics, institutions and economic performance, and the economics of transition. She has co-authored with David Soskice three macroeconomics books; the most recent is Macroeconomics: Institutions, Instability and the Financial System (Oxford University Press, 2015). She is a member of the Expert Advisory Panel of the UK's Office for Budget Responsibility. In 2015, she was named Commander of the British Empire for services to economics and public finance. Reserve your free tickets through the Lensic Box Office Online. 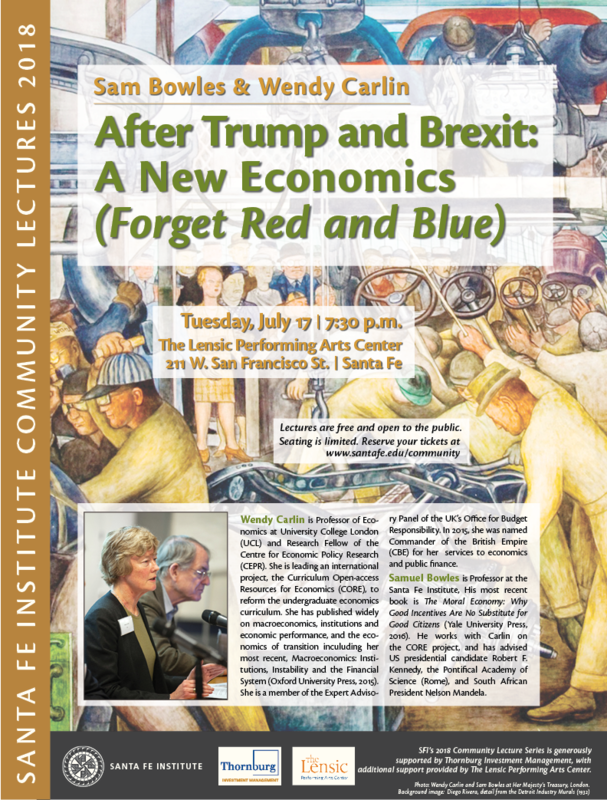 SFI's Community Lecture series is generously underwritten by Thornburg Investment Management, with additional support from the Lensic Performing Arts Center and Enterprise Holdings Foundation.